The MerR protein family is a group of transcription factors characterized by N-terminal helix-turn-helix DNA binding domains and C-terminal effector regions. Found widely in prokaryotes, MerR proteins are sensitive to a variety of environmental stimuli including antibiotics, heavy metals, and oxidative stress, but only a small subgroup of MerRs are sensitive to metal ions [1-2]. Members of this subgroup, which includes MerR itself, are called metalloregulators, and they modulate transcription by distorting DNA conformation in response to metal-binding . Copper efflux regulator (CueR) is a Cu+- and Ag+-sensing metalloregulator that controls the expression of two genes involved in metal homeostasis: CopA, which encodes a copper/silver ATPase, and CueO, which encodes a copper oxidase . Like most other metalloregulators, CueR acts on promoter DNA that exceeds the optimal length (~17bp) for recognition by sigma70, a subunit of RNA polymerase (RNAP) [1,2]. In its repressor form, CueR bends DNA at acute angles, stereochemically preventing RNAP from binding to both the -10 and -35 regions of the promoter . However, because CueR readily binds copper (KD= 2x10-21M), CueR is most often found in the activator form . In fact, its metal affinity is so high that Philips et al. (2015) had to mutate the metal-binding residues in the AgI-CueR complex in order to create and study a constitutive repressor. Once Cu or Ag binds to CueR, the protein enters the activator state, which introduces torsional stress on the DNA that brings the -10 and -35 regions into better contact with RNAP and thus optimizes RNAP-promoter binding. Through this dynamic command of promoter DNA conformation, CueR and its metal ligands are able to act as an ‘on/off’ switch for DNA transcription. CueR is a made up of ten five in each monomer. Dimerization occurs on the C’ terminal end through interactions between each monomer’s fifth alpha helix, aptly called the (DH). Through a the DH connects to a (DBD) on the N-terminal of the protein. The DBD is composed of four alpha helices (a1, a2, a3, and a4) arranged in a winged helix-turn-helix motif [1,2]. The ‘wing’ portion of the winged helix-turn-helix motif is composed of small which also interact with promoter DNA [1,4]. In the activator state, the dimerization helix is followed by a metal-binding loop (MBL) and a sixth alpha helix called the two turn C-terminal alpha helix (CTH). Both of these structures are disordered in the repressor. CueR recognizes DNA with which inserts into the minor groove and hydrogen bonds with the second nitrogen in the guanine at the 22nd position in one monomer and G23 in the other monomer (henceforth denoted as prime “ ‘ ”), as well as with an oxygen from T23/T24'. is also involved in DNA recognition. It inserts into the major groove and hydrogen bonds with the nitrogen and oxygen of G18/19' and the nitrogen of G17/18'. In both forms of CueR, the aromatic ring of participates in van der Waals interactions. These van der Waals are crucial for stacking with DNA bases,and despite existing in both the activator and repressor forms, these van der Waals forces have a greater role in stability in CueR's active state . The conserved van der Waals are not an anomaly; many of the CueR-DNA contacts between the DBD and the copA promoter are conserved in both the activator and repressor states. Notably, the a structure that consists of three arginine residues (Arg-18, Arg-31, and Arg-37) and the wing loop of the DBD, interacts with the phosphate groups of the DNA backbone in both the repressor and activator states. This "R Clamp" is thought to be responsible for distorting promoter DNA into A-DNA conformation, a topological change critical for transcriptional activation. The greatest difference between the repressor and activator is the conformation and spacing of the bound promoter DNA. The copA promoter is ~19 bp long between the -10 and -35 regions. In the repressor form, the seven central basepairs within the ~19 bp are in conformation. Once a metal ligand binds, the central DNA bends by 36 degrees and enters an 'A'-DNA-like conformation called TA-DNA. The the central basepairs (T12&T13’ and T13&G14’) also become in response to the widening of the minor groove . These conformational changes occur as a result of metal binding. When a metal ligand binds to CueR, it assembles the metal-binding loop (MBL) and the C-terminal helix (CTH), which were both disordered in the repressor form. In doing so, Ala118’ of the MBL hydrogen bonds with Arg 75 in the hinge loop, causing the arginine residue to flip out and displace a water molecule . In its new position, Arg75 acts as a link between the MBL and the DBD, where Philips et al. (2015) suggests it plays an important role in stability by establishing hydrogen bond communication between the subunits. Because transcription decreased in complexes with mutant Arg75 , the residue and the communication it mediates are thought to be crucial to transcriptional activation. The CTH further stabilizes the activator state by interacting with . Ile122, Ile123, and Leu126 of the CTH will insert into the cavity, causing Phe70)'s aromatic ring to flip out towards a4. This displacement forces the dimerization helices DHs (a5 and a5’) to "scissor", locking the complex in a tighter orientation and decreasing the distance between the DBDs in the process . Since the DBDs are bound tightly to the phosphate groups of the DNA backbone, pulling them together results in the kinking and undertwisting of promoter DNA, decreasing the distance by 6 angstroms. 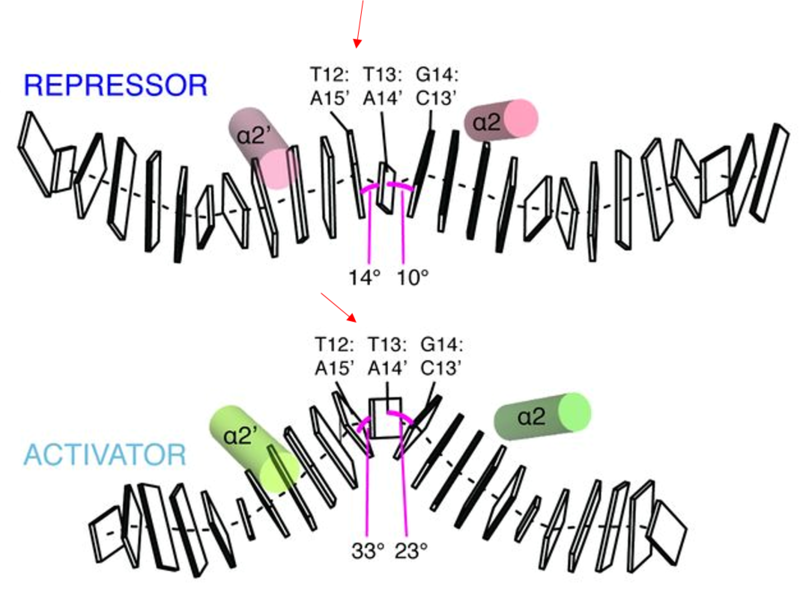 CueR's ability to optimize promoter length in the active form by retaining the protein-DNA contacts present in the repressor confers an advantage. It allows E. coli to survive in environments with elevated concentrations of copper, which would otherwise have toxic effects, without expending energy . 1. Phillips, Canalizo-Hernande,Yidirim, Schatz, Mondragon, O'Hallran. 2015. Allosteric transcription regulation via changes in the overall topology of the core promoter. Science. Vol 349:6250:877-881. 2. Brown, N.L., Stoyanov, J.V., Kidd, S.P., Hobman, J.L. 2003. The MerR family of transcriptional regulators. FEMS Microbiology Reviews. Vol 27:2-3:145-163. 4. Brennan, R. G., (1993). The Winged-Helix DNA-Binding Motif: Another Helix-Turn-Helix Takeoff. Cell. Vol. 74, 773-776. 5. Grass, Gregor, and Christopher Rensing. “Genes Involved in Copper Homeostasis in Escherichia Coli.” Journal of Bacteriology. 183.6 (2001): 2145–2147.